Did God Have a Person From Porlock? | "Northern Crossings"
Did God Have a Person From Porlock? I have mentioned that I am plowing through “Grammars of Creation” by George Steiner. It started our as a collection of Gifford Lectures and they must have been fascinating to listen to, but the reading is fascinating and exhausting. To try and sum it up in one sentence is pretty much impossible without perhaps making and absurdist claim but I am going to try. “Grammars of Creation” is about the organization of the way we think and feel and reflect on what we do that can be communicated to others in music or art or literature or speech that reflect the creative activity of God, whether we know it or not. That may sound cant coming from a preacher, but as of now this is what I think I am reading. There is a section in this book that is about the idea of distraction and creation. Here Luther is mentioned to have said that God created the Universe in a moment of “inadvertence, of absentmindedness” which would explain a lot from a human perspective. I can’t imagine Luther with his high concept of the Creator and Redeemer making that claim except in jest. The author himself believes that the quotation is at best an inaccurate translation if it was ever spoken, but it speaks of another flight of fancy that shows the human tendency to try and explain everything. Mention is made of a Jewish mystic idea that as God spoke creation into existence there was a scribe who wrote it down and that product was the Torah. The scribe in this tradition had a moment of distraction and left out a “jot or a tittle” and from that small discrepancy evil crept in to what was “very good”. The point is that the speculation, the study, the questions, the meanderings of science and philosophy and theology as to why there is “not nothing” becomes, in itself, creative. But even someone as brilliant as Stephen Hawking created gibberish speech when he tried to describe what there was before there was something. When we get to the Biblical narrative of creation we all get the person from Porlock who distracts us from the simple message. The idea that God created time and space and matter drives people crazy. Scientists can’t bring themselves to see Einstein’s theory spelled out in the first sentences of the scripture. When Einstein was asked to explain relativity simply he said that people believe that if all the stuff in the universe disappeared only time and space would be left. He said that his theory states that if all the stuff in the universe disappeared time and space would go with them. It is the backwards explanation of Genesis 1. 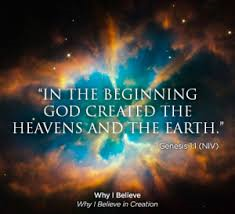 In the beginning, (there is time), God created the heavens, (there is space), and the earth, there is stuff. Obviously that is too simple so we have to invent languages and mathematical formula that try and explain what ultimately cannot be explained. Music and art are the artists way of trying to make sense of, or recreate the world. Part of the fall seems to be the need to “be like God” in understanding everything. We want to do away with paradox and once that is gone God disappears. His answer to our questions is the answer to Job; “where were you when I created?” Lutherans allow the paradoxes to stand. God didn’t have a Porlock moment. We do. In our “Grammars of Creation” we invent explanations of our self justification, self aggrandizement, self promotions and self love. We need to be distracted by grace and mercy, and maybe then we will get peace. Notes On Preaching 5 – Liturgy Vs Preaching.